In this section we review various KDE games from all over the world. We present a short description and critics of the reviewed game. Note that the opinion is the opinion of the reviewer and not an official KDE opinion. If you know about a nice game not listed here and want it reviewed just send a mail Andreas Beckermann and/or Martin Heni. Knights is a graphical users interface for KDE to chess engines like GNUchess. It also allows to connect to Internet chess servers. Therefore, a game of chess can be played against the computer or against another human player. Of course to play against the computer a chess engine needs to be installed on your computer but they should be supplied with all Linux distributions. The only backdraw at the moment is that you cannot select the strength of the computer enemy. But according to the auther this will be fixed in the next release. The program is really easy to use and provides most options you want from a chess GUI. Moreover, the game excels with easy/auto configuration of the chess engines and many cool looking graphics themes. The graphics is definitely a highlight in this game. Knights can be strongly recommmended for all chess fans looking for a nice GUI interface. License: Code and Graphics are published under the GNU General Public License (GPL). Taxipilot is a silly arcade-type game based on the simple but addictive principle of the classic Spacetaxi-game: You're flying a taxi and have to pick up passengers waiting on a number of platforms, and drop them, where they want to go. While the graphics are not exactly of professional quality, there are only six different levels so far, and sound is still missing completely in the current version, the game does offer some nice surprises and nifty features, that make it worth wasting some time. The game comes with an extensive documentation on how to create your own levels. So if you happen to be a better graphics designer than the author, the latter would be happy to hear from you. Kwappen is a nice cardgame along the lines of other patience card games where the aim of the game is to order cards to remove them from the game board. In Kwappen this is reasonable easy once you got the idea and you mainly have to fight the time. Although this probably won't catch you for a really long time it is a very nice game for a coffee break. Especially, as it presents itself with a very nice and colorful graphical interface. The game uses German heraldry symbols as card deck. This is a novel and good looking and vey nice approach. As the main rules of the game a summarised on screen you will very quickly familiarise with the game. License: GNU General Public License (GPL). Quintalign is an intriguing boardgame a bit similar to other Teris like boardgames. By moving pieces on a gameboard and aligning them you have to keep the board free, fighting against new pieces appearing every move and cluttering the board. The game extends the Lines and Klines games by variable and new rules and appealing graphics. The different levels make the game appropriate for everybody. 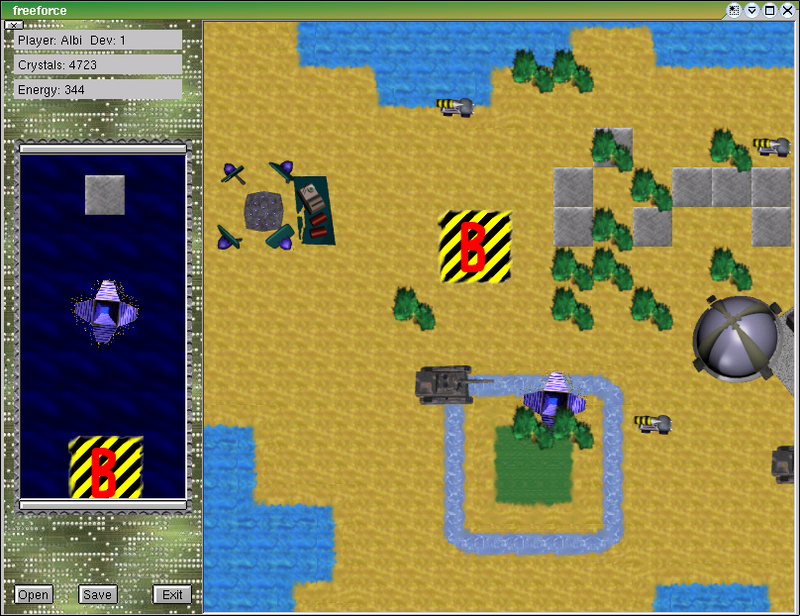 FreeForce is a real-time strategic game like Command&Conquer(tm). It has plugable units, a mapeditor and lot of other features. The game is still under development and is not playable yet. At this time you can test some features wich are already implemented in the game (little economy system). When you like to help us, join our projekt under join@freeforce.de. There you get your freeforce mail-adress, mailinglist acces and infos about developing freeforce. Kpooka is a logic game which is a cross between Pengo and Sokoban. The basic idea is to move a red figure across the board to the exit. Of course it is not that easy. The way to the exit is blocked by green boxes, which you have to push away. Unfortunately, you lack the strength to push more than one box at the same time. So it ends up as an intellectual challenge what box to push. The game has nice graphics, although some of the animations are not super smooth. However, kPooka is easily installed and played. You'll get the idea in a minute after starting the game. Like Sokoban it has an addictiveness to it which let you try a level until you manage to solve it. A well thought feature is that you do not have to play all levels again if you restart the game the next day but can continue with your highest level. 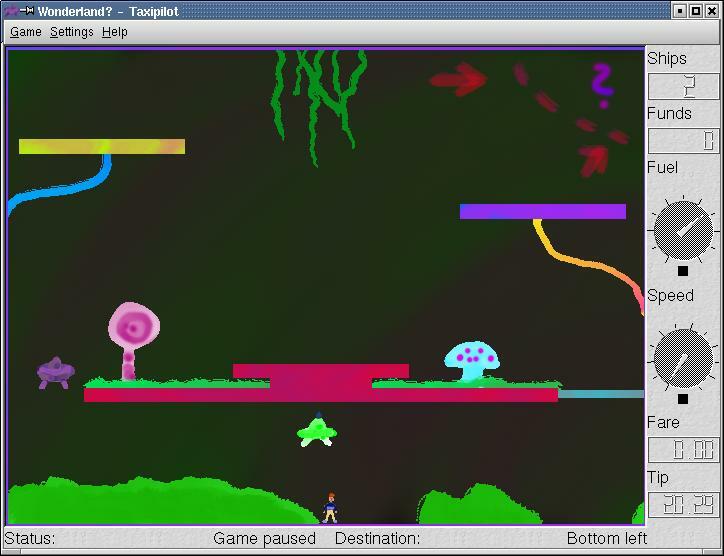 A few drawbacks can be found in the present version though: The game can only be played via keyboard and not mouse. There are not so many levels available. As you can created your own levels, this fact is compensated though. This game is a nice distraction in a coffee break. 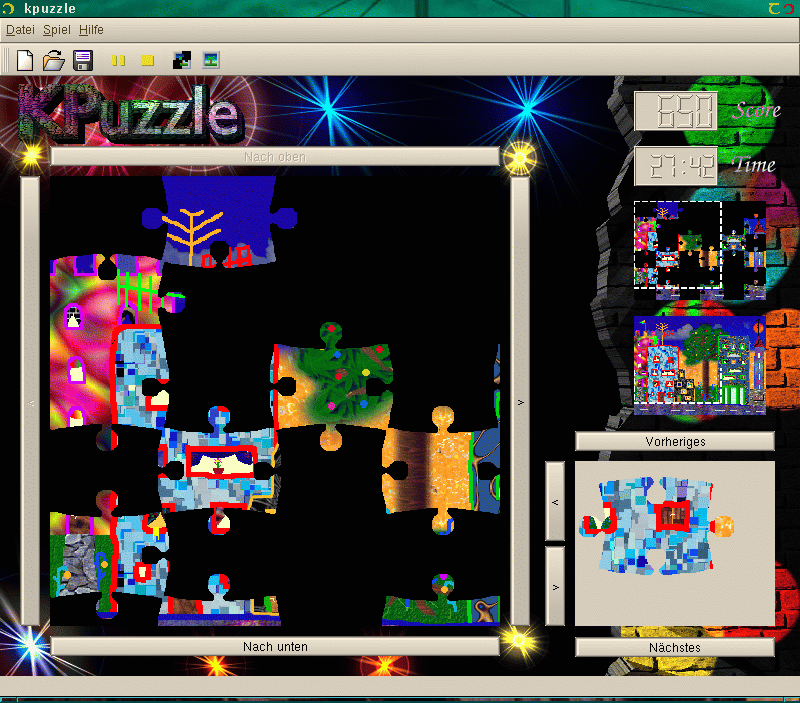 KPuzzle is a jigsaw puzzle game for KDE 2 featuring different game types with varying difficulties. It should run everywhere where KDE runs, too. Despite the low version number, the game is sufficiently stable to be entirely playable. What KPuzzle mainly lacks before really being finished is a lot of testing on different systems with different configurations and feedback from its users telling me what could be improved, especially in the game control. The download page contains various download links to the game itself and to picture sets accompanying it. There is a mailing list where you may ask any questions about KPuzzle. Find information on it at The List's Homepage. 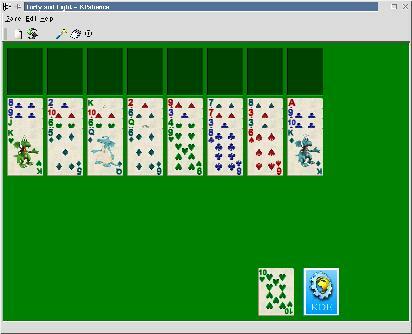 kPatience is a collection of well known patience games. Among them the well known Klondike and Freecell but also many more which are not so well known. The game has extremely nice graphics and is very comfortable to play. A hint and demo function is just as well included as the possibility to select a card deck of your choice. I think it is best summed up with the words of a friend of mine who is used to Windows(tm) and tried the kPatience: Wow, that game is super cool and way better than the Windows patience I am used to play. Everybody should play that.. This game is a must if you ask me! KPicFramer is a small solitaire like card game, where you have to place the 52 cards one by one into a 4x4 grid. All cards can be placed anywhere, except for the kings, the queens and the jacks. After getting used to the game principle the game is fun to play. A nice addition to the patience games of KDE. 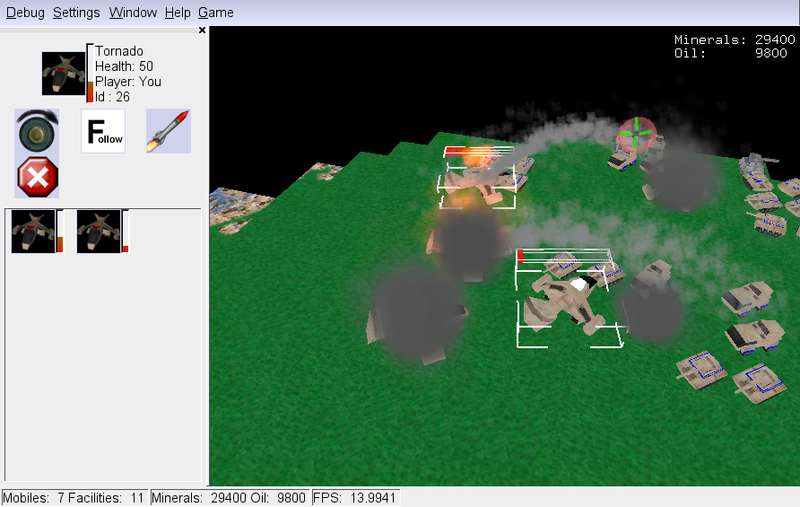 Boson is a real-time strategy game, like Command&Conquer(tm) or StarCraft(tm). It is designed to run on Unix (Linux) computers. A minimum of two players is required, since there is no artificial intelligence yet. Boson is still in very early development and not playable yet.